For years until the early 2000s, the Wexford jersey basically amounted to a gold upper section with a purple torso, the sleeves generally gold but sometimes purple (prior to the 1950s the colours were reversed, but the story of the switch is one for another day). The arrival of Gaelic Gear as kit suppliers brought about a bit of a change though, and when O'Neills took over the contract again in 2006, the more unconventional designs remained, with the current configuration at the start of 2012 the opposite of what most people would be used to (far left of image below). During the spring, however, two images popped up purporting to be the new jersey, each essentially the opposite of the other. 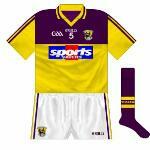 The first (second from right) harked back to the 'classic' design, similar to that used when the county last won a senior All-Ireland, while the other one (middle) was like a simplification of the design in situ. Disappointingly, both jerseys had the red and blue Sports Savers logo, which did not match the county colours, but it didn't matter as neither was used in a match. 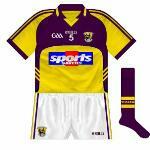 A new style that was seen on the field was that used by the county minors (second from right). 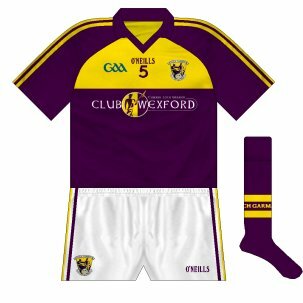 Sports Savers' deal was from U21 upwards and Club Wexford took over the minor sponsorship so the underage board decided on a new design, which was in their power, subjected to county board approval. 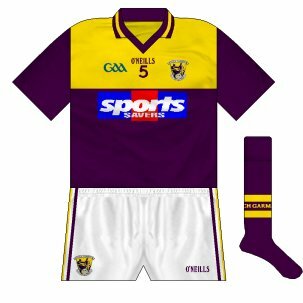 While the other designs had been considered, at senior level the only change seen was that front numbers were now gold rather than white (far right). A change may take place for 2013, however.